With the help of Family Farms Meats, the vacuum massage tumblers were designed and produced with the ingenuity of the staff at LMI Manufacturing. 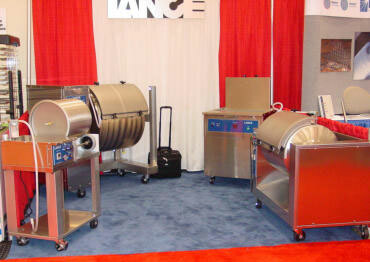 Since 1985, Lance Industries has been producing massage vacuum tumblers in Hartford, Wisconsin. With its root in the dairy state, Lance Industries works with domestic and international dealers providing meat markets, meat processors, grocery stores and restaurants around the world with high-quality meat tumblers at an affordable price. As a member of the American Association of Meat Processors (AAMP), Lance Industries attends the national convention each year. This year’s convention is held in Kansas City, Missouri. On a local level, Lance Industries is also a member of the Wisconsin Association of Meat Processors (WAMP). Check out a photo of our booth at the convention this year, which was held in Middleton, Wisconsin.